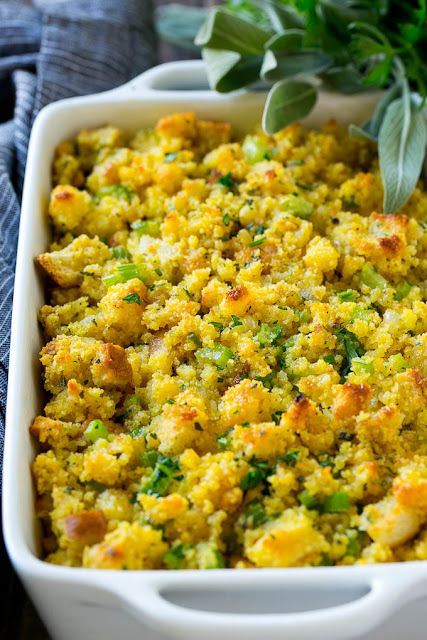 Today we're talking about stuffing, because Thanksgiving is almost here! There are about ten million ways to do stuffing, but this Southern cornbread dressing is my favorite. It's moist and delicious with a light and fluffy texture and the perfect blend of sweet and savory. Not gonna lie, my husband and I both made this our dinner after I took these photos, it's just that good. Prepare the honey cornbread according to post instructions. Cool the cornbread and crumble. Place the cornbread in a large bowl with the bread cubes and toss to combine. Preheat the oven to 350 degrees. Coat a 9"x13" pan with cooking spray. Melt 4 tablespoons of butter in a large pan over medium heat. Add the onion and celery and cook for 6-8 minutes or until softened. Season the vegetables with salt and pepper to taste. Place the vegetables in the bowl with the cornbread mixture. Melt the remaining 6 tablespoons of butter and pour into a large bowl. Add the chicken broth, eggs, salt and pepper to taste, and sage and whisk to combine. Pour the butter mixture into the bowl with the cornbread mixture and stir to combine. Transfer the stuffing mixture to the prepared pan. Bake for 45 minutes or until dressing is browned and cooked through. Sprinkle with parsley and garnish with sage leaves if desired. Serve.